My next event will be the Open Studio Tour. Along with a multitude of other Tucson artists, I will be welcoming visitors to my studio on Saturday and Sunday, November 12 and 13, from 11 a.m. to 5 p.m. both days. I will be doing some turning each day, so please stop by and see how I do what I do. Click here to see where my studio is. You can view a list of all the artists participating in the tour, with maps to each location, at the Tucson Pima Arts Council web site. My fellow Flux artists will also be participating, with Lee Roy Beach, Mary Vaneecke, and Sheryl Holland setting up shop at Flux Gallery, and C. J. Shane, Dragana Skrepnik, and Peter Eisner hosting visitors at their own studios. My next public event will be the Flux anniversary celebration on Friday, October 14, from 5 to 8 p.m. Come celebrate our 2nd birthday with us and help kick off our third year with a bang. and the Tucson Museum of Art Holiday Artisans’ Market, November 18 to 20. I will post details for the shows and events as I get them. Please note that one of my usual fall shows, the Big Brothers Big Sisters Southwest Flair A-Fair, scheduled for October 28 to 30, has been canceled this year by the organizers. And looking further forward, come next year, from February 2 to March 13, I will be showing my work at the Tucson Jewish Community Center, in a two-person show with fellow Flux artist C. J. Shane. The official Open Studios web site is experiencing some temporary growing pains and should be back on Thursday. In the meantime it’s redirecting to their Facebook page. To fill the “map gap” there’s a new interactive Google map of all studios and artists linked to the Facebook page. 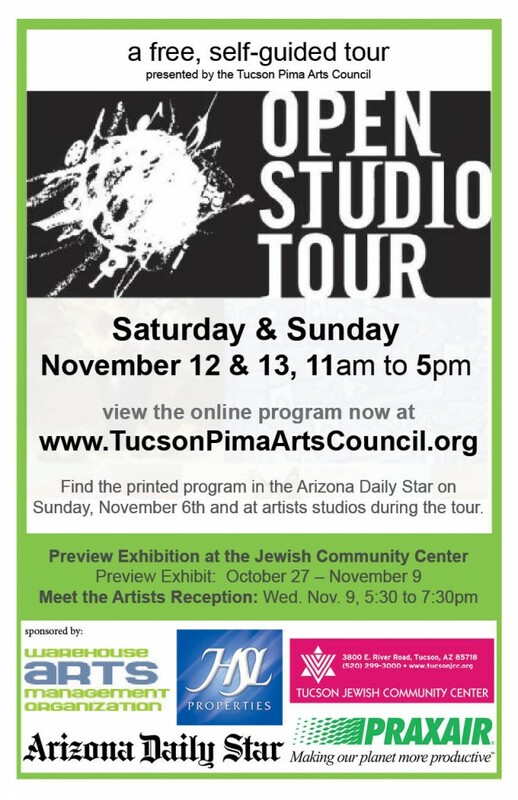 Once again, the artists of Tucson—including me—will open their studio doors to visitors for the Tucson Artists’ Open Studio Tour. This time around, instead of just cleaning up and setting out work, I’ll be working at the lathe throughout the weekend, so if you have ever wanted to see me turn, come on by. I’ll be here 11 a.m. to 5 p.m., Saturday and Sunday, April 16 and 17. For a complete list of the artists participating and maps to their studios, pick up the April issue of Zócalo Tucson magazine or visit the Tucson Open Studios web site. One of the visitors to my studio posted photos on her blog. See them here. The commentary is in Japanese, so most of you won’t be able to read it, but you can see the images. 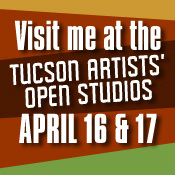 The spring Tucson Artists’ Open Studio Tour is coming up again next weekend, March 13 and 14. I will be here from 11 a.m. to 5 p.m., so please come by and see what I’ve been up to (and get first dibs!). I may even have some work in progress on the lathe, as I’m busy getting ready for the Spring Artisans’ Market at the Tucson Museum of Art at the end of March. I’m especially trying to finish some mesquite vessels with stone inlay. You can find all the details about the tour, including a complete list of participating artists and maps of the studio locations, online at the tour’s website or in the current issue of Zócalo magazine. (This “Tucson Urban Scene Magazine” is worth hunting down; read it online or find it at various locations around town.) Fellow Flux artists Steven Derks, Peter Eisner, and Maurice Sevigny will also be opening their studios.